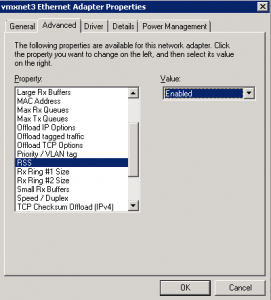 To resolve this issue, disable the TCP Checksum Offload feature, as well enable RSS on the VMXNET3 driver. Next we will need to turn on RSS feature on the VMXNET3 driver. 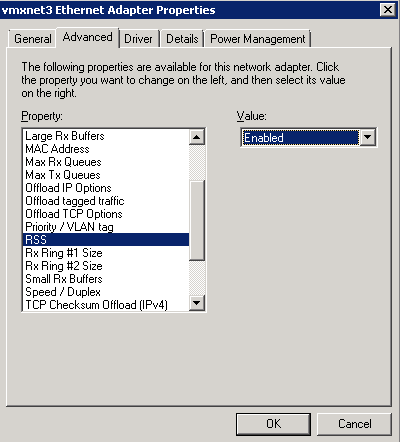 To do this open the network connections and adapter settings. Open Control Panel > Network and Internet > Network Connections. Right click on your adapter and select properties. Click on the Advanced tab and scroll down to find the RSS setting, you will see by default it is set to disabled. Set the drop down to enabled and click ok to save the settings. If you find there is no change just reset to default. I followed these directions on a Server 2008 R2 domain controller / sql server VM, and it knocked out active directory. I had to restart the AD service to get it to work again!